(June 27, 2018) The Eastern Ontario Regional Network (EORN) is pleased that all Members of Parliament representing the region, and from across party lines, have signed strong letters of support to the federal government to help fund proposed cell service improvements for the region. Fredericton, NB (May 31, 2018) – Brenda Orchard, Chief Administrative Officer for Lennox and Addington County, ON, has been elected to the board of directors for the Canadian Association of Municipal Administrators (CAMA). She was elected as the CAMA Board Representative for Ontario during the association’s annual general meeting, held on May 29, 2017 at CAMA’s national conference in Fredericton, NB. 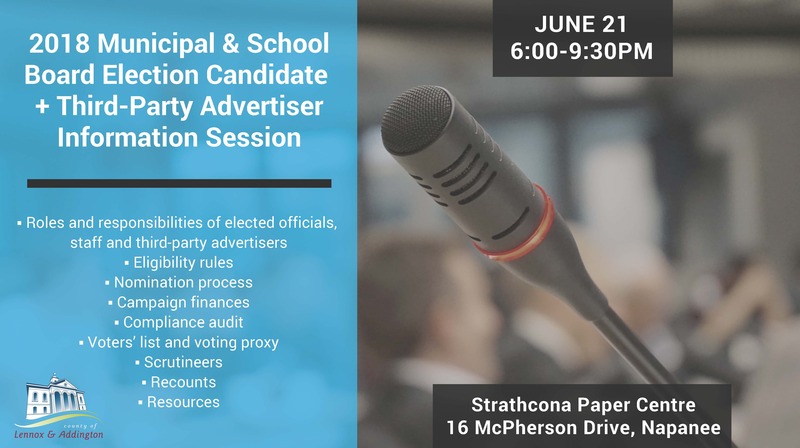 If you are interested in being a Council or School Board Candidate or a Third-Party Advertiser in the 2018 Municipal and School Board Election, then this information session is for you! The Eastern Ontario Wardens’ Caucus and Eastern Ontario Regional Network (EORN) welcomed the Ontario Government’s commitment of $71 million to improve cell service across the region. Ontario Rural Affairs Minister Jeff Leal announced the funding formally at an event in Belleville yesterday.